Thread: Rotor ring on a SS? Anyone using a oval rotor ring on their single speeds? How well does it work? As in a BioPace chainring? requires a sprung tensioner, dedicated SS frames won't work with it since the chain length varies depending on what part of the "oval" the chain's on. I won't do it since there's no guarantee I won't have to pedal kick with my feet in the "dead" position on that chainring. that and I had biopace rings (have a couple in the basement actually) and didn't like them anyways. Actually you don't need a sprung tensioner. Believe it or not. i have seen fixies with biopace. like sparty said, no tensioner is required. I ran one for a while w no problems. May throw it back on now you reminded me about it. I've been using a Rotor Q-Ring on my SS for several YEARS. I have had absolutely ZERO issues. The chain does get tighter and slacker, but I've never had it come off, or skip or anything. The ring (36 tooth) was expensive (and probably needs to be replaced) but for as long as it's worked I think I got my money's worth. Now if you ask me if it "helps"... I don't think I can answer that question because I've been riding it so long. 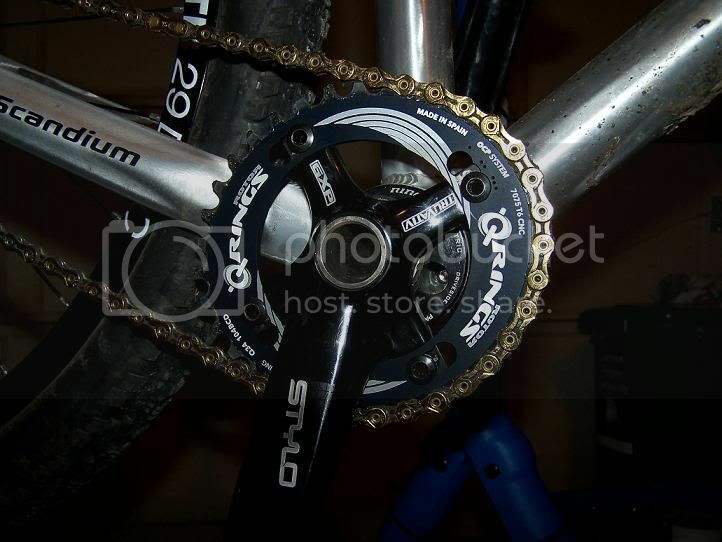 I intend on getting some Middleburn cranks with a round Uno ring. After I've done that maybe I will notice they are gone? Maybe I won't? Rotor stuff is timed differently than biopace, so its not comparable. More specifically, they have many holes - so you can time them to your preference. I've been running the full Rotor cranks on my MtFx for several years now, and I can tell you that they do work well. I'm running 34x20 on trails where many run 32x20 - and I'm nothing special as a motor. Reviews that I've seen say that the Qrings deliver 90% of the pedalling power and efficiency of the cranks - for a fraction of the cost (still pricey tho). I still like the "no dead spot" of the cranks, but I bought mine used for less than 1/2 of new price. How tough was it to set up? If you were going to just but the ring it wouldn't be too spendy. what are the advantages of Biopace and rotor rings? Leverage changes throughout the revolution of the cranks. Whether you see this as an advantage or a disadvantage is up to you. The setup for cranks or rings is all about "clocking" - getting the variations of the drive to line up with you. The crank setup works kinda like an eccentric BB - have to rotate the BB to line up with marks. To figure out what I wanted, I set them up in the recommended/middle position and rode a couple times, then adjusted to one extreme/rode, then the other extreme/rode. Found out the recommended middle worked best overall, was smooth (like a turbine rather than a 2 cylinder engine). The extremes seemed a bit "lumpy", had definite surges of power as you went thru a spin cycle. High setting climbed faster, but made fixie resistance/pushback not work as well. Low setting was just the opposite. The ring setup ( https://www.rotorbikeusa.com/pdf/Q-R...l%20models.pdf ) is pretty simple - find the marks on the ring, line them up and bolt them on. Again, you've got 5 marked options - but it just takes unbolting the ring/moving it/bolt it back down to see how you like it. The basic idea of all this "eccentric" stuff is that your legs have different levels of performance available as they go thru a spin cycle, and that varying the amount of leverage you have can align with that and give you an advantage. Different theories exist on what that alignment is - my first mtb had biopace, and it was very "lumpy" and didn't seem to give any advantage in climbing. It was like just as you were getting on the power stroke the resistance would give way. Bleh. "Rotor Q-Rings enable the legs to remain in the power stroke for a longer period of time when compared to round chainrings. Q-Rings change the equivalent tooth size by decreasing it before the dead-spots and increasing it when the rider is in the power mode (when more power is available at the pedal down stroke). 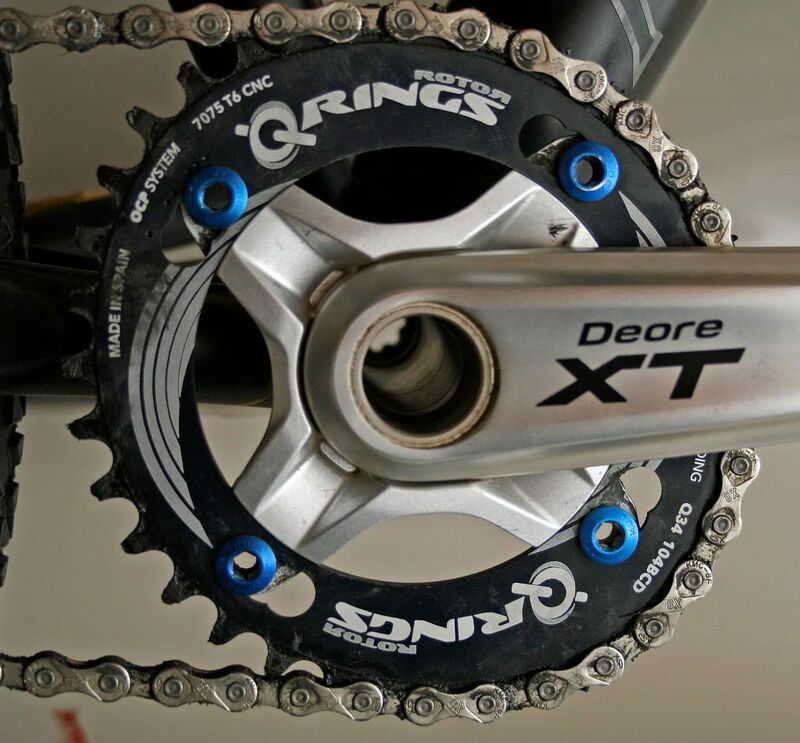 A 44T MTB Q-Ring, around the upper dead-spot is equivalent to a 42T, but as the pedal goes down and more strength is applied (just passed the maximum power moment), the equivalent chainring tooth size reaches 46T." So when I go to stand and stomp the equivalent gear is increasing as the power comes on in the downstroke, then on the return cycle I get a lower gear/faster return. I actually can take advantage of this when climbing by pulling up strongly on the back stroke - lower gear where the leg is weaker! I note that on the rings it's +/-2 tooth, but the cranks are +/-4 tooth change. Got it setup, will take it for a spin tommorrow to see how it works in SS mode. I think I might have to give my biopace crankset a try SS. Freaking Sheldon Brown. I really like rotor rings. I raced cross with one last year and was really comfortable with it. After that I really wanted one for my SS, it just makes sense once you try it. I have only tried the center position but think I'll try a more aggessive position. I wouldn't mind a more exagerated oval. Glad to hear positive reports. I have a 38t SS Rotor ring waiting for a worhty crank, to complete a Superfly build. 1x9 or SS, depending on circumstances. worked well on my Dean SS (sliding DO, no springy thingy), and it actually did make me feel like climbing standing got easier.. but it worn out fast and i could not justify its cost. Roads? Where we're going we don't need roads.. I have the Rotors on my SS, and it makes those grueling hills... not less grueling, but doable. Just because it gets you over the dead-zone you cannot forget that during your "power-zone" you're actually pulling a larger gear. My ring is a 33T but it's like having 31T through the dead and 35T during power. I have mine set up in a normal SS frame, and have never had the chain drop. I wish they weren't so darn expensive however. I think when these rings wear-out I will just get some of those 31T machined rings from a forum member. I run 1 x 9 on both my 29ers, i have a 33t rotor ring upfront on each . I was told the the singlespeed specific rotor ring ( 34t ) has only 6% ovalization versus the 33t ramped rings same as i have fitted that are 9% ovalization. Im waiting on a One9 frame arriving anyday and will be transferring the drivetrain over from my HT. I would have expected the SS specific ring to be more ovalized than the normal ring. I wonder why it's less? Dunno mate , i looked on the rotor website but cant find any info . Was told that by the bikeshop ... besides i am happy enough as its my first SS and the lighter gear sounds good at the moment till i see how i go , 33t rotor ring front and 18 surly rear. How does changing the bolt postion effect your power? I started on number #2 and am having trouble making some climbs I normally clear. Should I try the number #1 or #3 position? I started in the middle went to the front but decided the middle was best. I did the Brown County Breakdown 75 miler on my 29er single speed and was a climbing fool. Love this ring! i have quite a few rides on my rotor ring/15g cranks set up on the ss. i went straight to the #3 position on the ring.....the directions implied that this position aids standing climbing. and, that the #1 position might feel better for the sit and spin climber, and #2 is a good starting position. i haven't tried the #1 or #2 positions yet....just #3 on the ss (and it feels great, ain't gonna change it). 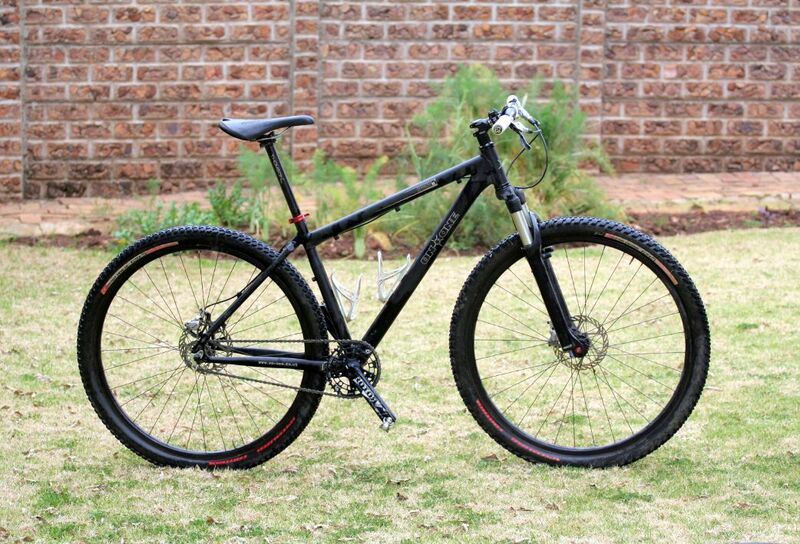 i might try the #2 spot the 1x10 geared bike. They have a HUGE profit margin on those from a manufacturing standpoint... holy crap! no one will stop you from making an elliptical cog though. In both pics you guys are running the chainring in the outer/big ring position.. The SS ring is made,and back up by an email from Rotor, to be ran in the innter/middle ring position. Just a little FYI. But, do what makes you happy. And works best for you. You are right, the ring actually has a recess on the backside for the chain ring bolts. On my ONE9 with STYLO cranks even a 32T standard ring is VERY close to the chainstay. The 34T ROTOR ring at it's "widest" point would be equivelent to a 35T which was DANGEROUSLY close to the stay. It was a FLUKE that the chainring bolts that the stylo came with (comes with a bashgard) were the PERFECT length to mount the Rotor ring in the bigring position. 1. both will work fine on a non-tensioner equipped SS. indeed, if the rear cog were the same # of teeth as the oval ring, the tension would remain exactly the same thru the 360 degrees. the difference chain tension that does exist is due to the difference in cog/ring size - not the oval ring alone. in most applications, the diff is not an issue - it would be if you ran a 65T oval ring and an 11 cog but obviously nobody does that. 2. biopace and rotor rings "work" in exactly the opposite manner. their oriention to the lobed portion of the oval is diametrically opposed to each each other. with biopace, the bike is easier to pedal when you stomp down in the power-phase of the circle. you have the smaller portion of the biopace ring in that part of pedal stroke, creating and effectively easier gear as you push down/pull up. naturally, as you push over the top or pull back along the bottom of the pedal stoke, it is harder to do so because the effective gear is harder there. with rotor, it is harder to pedal the bike on the downstroke. the idea with rotor is that for a given 360 degrees of crank rotation, you spend more TIME in the pedal downstroke/upstroke, and you speed thru the "dead-zone" at the top and bottom of the pedal circle. 3. interestingly, if you lay a rotor ring and a biopace ring on top of each other, you will see they almost exactly the same shape. BUT, when you mount them up they are oriented exactly opposite of each other with relation to the pedal stroke. as noted above, tho - you can move a rotor ring outside its intended oriention and make it work like a biopace ring. but, the reverse is not possible. I have been running one for about 6 months(aprox 2300 miles) now on my sir9 and think highly of it. 2 days ago I decided to do a full power interval up a high traction very steep hill and pow! the crank went free spin the chain flopped and what I thought was a broken chain turn out the be a busted ring, bummer. From what it looks like it sheared in the thins part of the ovalized ring and around all 4 of the bolts. while I tore it down I checked everything- bolts were tight, chain gauge checked good(only 1 month old), and chain line was spot on. The only thing I could not check was tension but this bike has always held tension well. Like I said I have gotten 6 good, happy months out of this ring with no issues. This set up has been extremely reliable til then. I do notice that they make a singlespeed ring now that is thicker in the area mine broke, so maybe this will fix this possible issue. I'm going to get with rotor today and see what they think, I liked this ring. wow. impressive damage. hope you didn't hurt yourself. holy crap, you totally tweaked that thing, it's completely out of round! Hey madss, when I look at the 1st pic of of the inside of your cranks. One thing stands out. I was told years ago by a training partner of mine. Who's a lot smarter about bike stuff than me. That when you use a crank that is not SS specific like you are useing. You should always use the chainring bolts in all the holes. That includes the ones for the inside where the little rings would go. You may be getting too much flex when standing and climbing.. The integrity of the crank is not whole. Not saying this is why your chain ring broke. But just more or less FYI for future setup. Good luck. There is a contingent out there that believes you need to fill the unused mounting holes in cranks, something I do not believe.The idea that adding the weight of unneeded mounting bolts thinking the threading will somehow hold the a crank together or make it stronger just doesn't ring true to me; especially the granny gear mounts that many just Dremel off. For RaceFace Turbines and NextLPs, but I don't think that is true of other cranks. ... as noted above, tho - you can move a rotor ring outside its intended oriention and make it work like a biopace ring. but, the reverse is not possible. Sure it is. Just shift the Biopace ring a bolt hole or two away from the place the instructions tell you orient it. I did this back in the late '80s, before abandoning Biopace in favor of round rings once again. Yes that's true. I found it looks better and works very well in this position instead of using single speed chainring bolts you use double chainring bolts. You just need to properly align the rear cog for a straight chainline. Plus ring it geared verse a singlespeed may make a difference too. Hike it or Bike it! Maybe even a bash guard on the outer ring slot as well. If you are running a 1x9 or 1xwhatever drive train, I ASSUME you are using a rear derailleur anyway. So no, you wouldn't need one (since you are already using one). If you use a Speedhub/Alfine, then you maybe not need one. i believe he was refering to the front. A chain retention device to keep it on the front ring, not chain tensioning. I would run some sort of chain keeper, however i'm not sure what would work. I'm guessing the Paul isn't going to work too hot. Yes, that's what I meant - up front in replace of the front derailleur on a double or triple set up. You think the Paul wouldn't work because of the oval ring causing the chain to rise and fall too much and there not being enough room for that in the Paul? that's my uneducated guess. I could be wrong, i havent looked into it. Certainly this has to be correct. The Paul unit has little clearance, even for side to side movement of the chain as it swings from biggest to smallest cog when employing a round chainring. On my 1x drivetrains (round ring), I use a Jump Stop on the inside and a guard ring on the outside. I don't see why the same setup wouldn't work just fine with a rotor ring. Just adjust the Jump Stop so the up/down movement of the chain is with the JS's parameter and run a guard ring that is large enough to protect the outermost portion of the rotor ring's oblong shape.